A specialized device for specialized ropes. Compact and ultra-light, the Micro Jul device is designed by Edelrid for belaying climbers using half and twin ropes between 6.9mm and 8.0 mm in diameter. 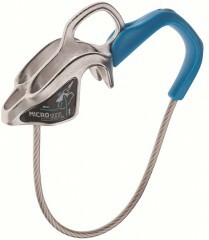 It can also be used for rappelling, especially on skinny rope such as the 6mm Rap Line. An ISPO 2013 award winner, the Micro Jul weighs just 62 grams (2.2 ounces) and features multiple friction options depending on how you feed in the rope. The best description can be found in this video. Lightweight stainless steel construction can stand the test of time. Can be used to rappel, belay a leader, or bring up two seconds. Good braking performance helps catch leader falls. Small eyelet accepts a carabiner to release rope when bringing up a follower. 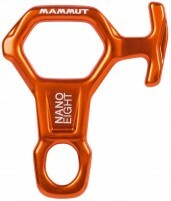 Convenient thumb hold can be used to feed out rope quickly. Can this be safely used with the Petzl Rad Rope? Will it provide an effective hands-free option with that line? Thanks! Hi Paul, we haven't tried it with the R.A.D. line to say with total confidence, but this device is only rated to 6.9mm and the R.A.D. line is 6mm. It's not likely that you'll have a 100% reliable, hands-free option with that combo. Hi Paul, for what it's worth, I've used this with even skinnier rope (6mm Edelrid rap line) and it had sufficient braking power.